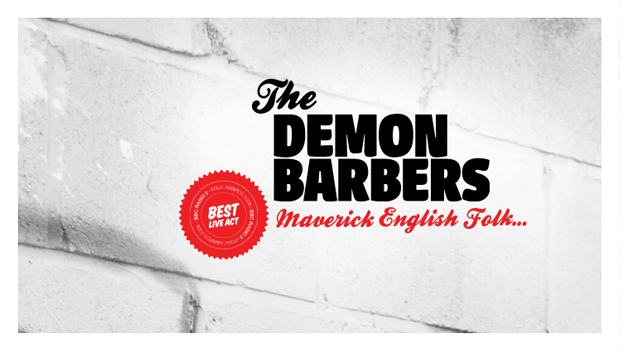 The Demon Barbers have had a busy year. With continued success and a growing following it was time to create a logo for the band that was easily recognisable and reproduced. Through discussions with the band we recognised that a bold, simple and friendly approach would suit the band. Something that would reflect the energy and humour of their live performances. The band also tour a ‘Roadshow’ where the band is joined by a number of dancers. The logo needed to be flexible enough to incorporate the Roadshow when needed. Design By If developed a simple typographic logo for the band. 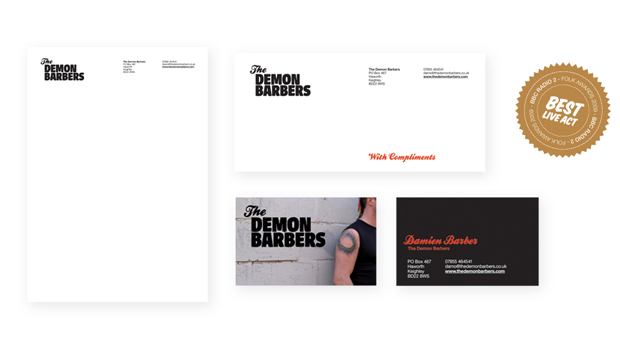 ‘Demon Barbers’ is shown in the main typeface which is clear, strong and bold but with cheeky quirks and tweeks adding a hint of humour and naughtiness. ‘The’ is set in a secondary, slightly frivolous typeface which acts as a friendly introduction to the band. When touring with the dancers ‘Roadshow’ is added under ‘Barbers’ to create a seperate but immediately recognisable logo. 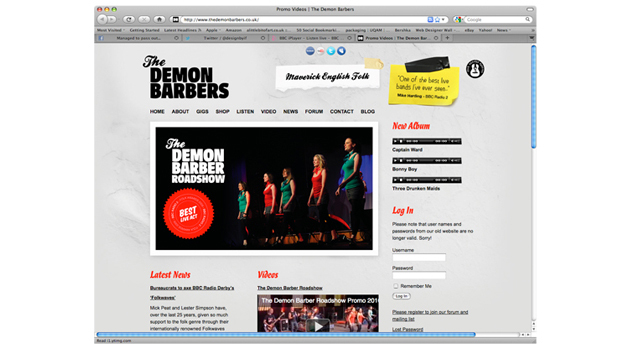 The Demon Barbers website was outdated and clunky and the band was embarrassed to use and promote it. They asked Design By If to solve their web problems and we were happy to help. The band needed a new website that was engaging and encouraged people to buy albums and come to shows. 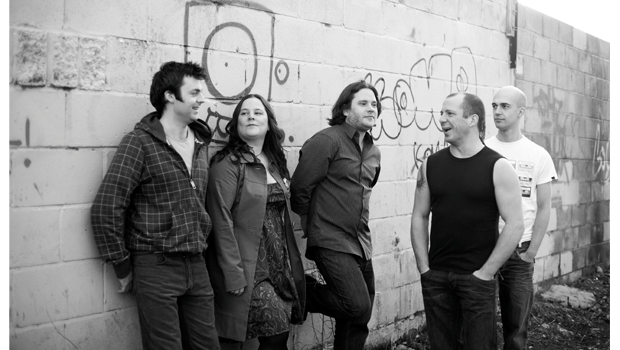 Over time the band hoped the site would become a hub of information on folk music and dance. For this to happen easy and frequent updates to the site would be essential. The band now have a newly designed website with a slightly punky feel that compliments their growing ‘maverick English folk’ brand. The site holds a lot of information from the news and video pages to the shop and the gig lists which are all easily and frequently updated by the band. They encourage discussion and the exchanging of ideas through their forum and blog posts. The site is also linked directly to all the bands social media accounts creating a constant feed of tweets and facebook dialogue, this allows the band to communicate with their fans in their own virtual spaces all over the world. 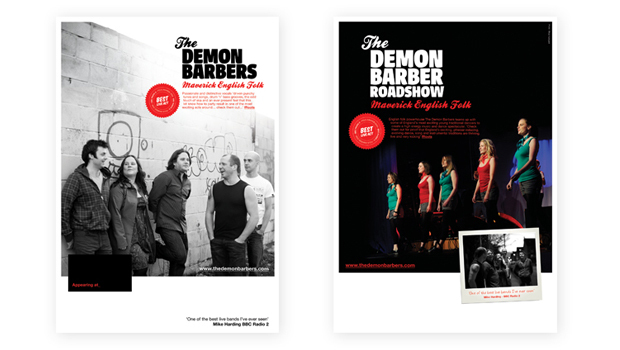 All of these features allow The Demon Barbers to add to their audience on a daily basis, not just at gigs or festivals. The Demons have a site they are proud to promote and in turn the site promotes them… a perfect relationship!